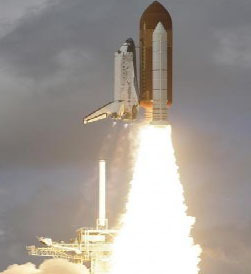 4 Apr : NASA has cleared space shuttle Discovery for a Monday morning launch to the International Space Station. Mission managers met Saturday and gave the “go” to proceed toward liftoff. The unanimous decision came after engineers determined there were no booster rocket safety concerns. Two booster problems recently cropped up when the parts were tested off-site. Forecasters expect an 80 per cent chance of good launch weather. Liftoff is scheduled for 6:21 a.m. (1021 GMT), shortly before sunrise. Discovery is loaded with spare parts and science experiments for the space station. Only four shuttle flights remain. President Barack Obama will visit the Cape Canaveral area on 15th April – while Discovery is in orbit – to elaborate on his post-shuttle plans.